buffalosabresnow: Rasmus Dahlin and fellow prospects hit the ice tomorrow for Sabres D-Camp. Rasmus Dahlin and fellow prospects hit the ice tomorrow for Sabres D-Camp. There's a lot of love being thrown around Washington Street these days. 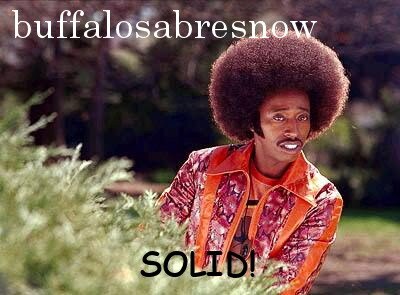 Everyone in Sabreland loved the fact that the lottery was kind, giving Buffalo the first overall pick this year, Buffalo fans love what their seeing in the future as defenseman Rasmus Dahlin joins center Jack Eichel as cornerstones of the franchise and Dahlin himself said he loves the fans and Buffalo as well. "Yeah, they are great fans. I heard so many great things about them," said Dahlin post-draft to the gathered media. "Like they love hockey in that city and I can see that, when they come to me, they know me and I don’t even play in the NHL. So they probably love hockey. So, yeah, I’ve heard so many great things about them. I’m super excited to meet all the fans. "I've been like finally -- put on the Buffalo Sabres jersey. I've been [to Buffalo] twice and I love that city. I can't wait to get everything started." Dahlin has all kinds of love, beginning with the game he plays. "I love to play hockey and why put pressure when you can paly the game that you love." The cool part about Dahlin's selection, which came after the tank, the drafting of Eichel and 2014 second-overall pick Sam Reinhart, the coaching changes and the fall back to the bottom of the league, is that through it all, he's not the lone centerpiece of a rebuild. As GM Jason Botterill said at Dahlin's introductory press conference yesterday, "We're excited about our young players such as Jack (Eichel) Sam (Reinhart), Rasmus Ristolainen," Botterill told the gathered media yesterday. "He can be part of this group to grow together. We certainly have to have better results on the ice. But in communicating with other players, they're certainly excited to bring Rasmus into our group here and just how they can grow together as a core. "He doesn't need to be the savior." Conspicuously omitted from that core was the name Ryan O'Reilly. The center has been the subject of trade rumors for much of the off season so perhaps there was a bit of a Freudian slip there. Or perhaps when Botterill was talking "core" it was simply that the 27 yr. old O'Reilly didn't enter his thought-process when grouping those young players who are all 23 or younger. Regardless, the cool part is that there is core, and a very talented one at that, whom Botterill will build around. 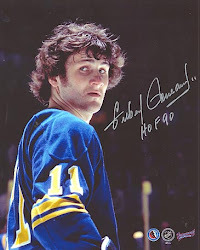 The Sabres do have some players already on the team that they will be moving forward with and some young players with pro experience who may make the jump to the big club or might be very close. Botterill's core plus those groupings will make up the team near-term but the future, after Eichel, Dahlin, et al, really centers around the prospects and they'll be in town this week for Sabres Development Camp this week. Originally a rather quiet affair that took place in early July at Dwyer Arena, tucked away on the campus of Niagara University in Niagara Falls, NY, the camp has evolved into an event. With owner Terry Pegula pumping huge money into HarborCenter and all it's first class facilities, the team made moved camp to downtown Buffalo. The structure of the camp has changed as well. As usual, the on-ice workouts are there over a three-day period but the team put an emphasis on the annual three-on-three tournament as it's keynote event. Prior to last season, the big event was the Blue and Gold Scrimmage which took place on the fourth day of camp and saw 17,115 fans come out on a hot July day to watch Eichel on the ice in 2015. The following year it was moved to HarborCenter where some 1,600 fans attended and last year the scrimmage was eliminated. The three-on-three tournament was always on the final day and was geared more towards the hockey department than the casual fan and as of last year, The French Connection Tournament, as the three-on-three tourney was named, took center stage as the closing event. The event will take place at 10:45 am on Saturday and will be streamed live on Sabres.com. A total of 42 prospects are scheduled to hit the ice beginning tomorrow including all six players selected at the 2018 NHL Draft as well as camp invitees.